A couple weeks weeks ago, we attended the GIE+EXPO, the largest trade show for green industry businesses. Every year there seems to be something unexpected that happens at the show, and this year was no different. A thunderstorm rolled through Louisville and took out the power for half of the convention center. Luckily, it wasn’t our half. Field Service Software continues to see growth. When we first started attending the GIE+EXPO, there were a few field service software solutions we competed with. Now, there were roughly 10 exhibiting at the show. What’s noteworthy about many of these green industry solutions is that they tend to be niche solutions. Service Autopilot focuses on lawn maintenance businesses, LMN sells primarily to landscaping businesses and the HindSite Solution is the best irrigation business software available, and folks like Fleetmatics develop field service GPS software. No one has yet really created an all-in-one solution for the multi-service green industry business. That will change, however, if we have anything to do with it. At GIE we launched the lawn maintenance software module for FieldCentral, our new cloud-based solution. Over time we’ll add irrigation, landscaping and snow removal modules. We believe a green industry business shouldn’t have to use three different software solutions to manage their business, and we’re doing something to rectify that problem. Business is generally booming for green industry businesses. This was by all accounts the largest GIE+EXPO in the history of the event. There were more exhibitors than we’ve ever seen and rumor has it there were close to 20,000 attendees. As we’ve heard most of the year, the biggest issue a lot of green industry businesses face is finding employees to do all the work that’s out there. Thankfully, unlike 6 or 7 years ago, the economy has improved and the work is out there. That also means there’s an opportunity for green industry businesses to ratchet up their growth and grab some more revenue while the economy is doing well. Adding services can help. Investments in equipment can also make you more efficient and grab more market share. And investing in field service software can also help you take control of your business, spend less time working in your business and more time working on your business. The greening of the green industry is apparent. One of our customers, Conserva Irrigation, has a unique marketing message. Their irrigation systems will, as the name implies, conserve water. They’re an example of the greening of the green industry. The GIE+EXPO had an abundance of green products. For example, the GIE+EXPO always features a new product showcase. Among the limited entrants was an organic fertilizer by Nature Safe Natural & Organic Fertilizers. And Husqvarna was among a number of exhibitors who showcased battery-powered equipment. Even though most green industry businesses dislike battery-powered equipment, a Husqvarna survey found that consumers prefer landscapers that use eco-friendly methods and equipment, and would pay more for those landscapers. The future is clear: More and more consumers prefer green solutions. Green industry businesses - like Conserva - can gain significant market share by marketing eco-friendly products and services. Labor-saving equipment. We’ve heard from a number of our customers that finding labor is getting harder and harder. Acquiring and retaining employees is getting more difficult as the labor market tightens. Many manufacturers highlighted solutions at the GIE+EXPO in the form of robotic or automated lawn mowers. For example, John Deere showcased the Tango E5 autonomous lawn mower. Even chemical manufacturers are developing longer lasting chemical applications that require fewer visits to apply. Like other industries, the green industry is going to be impacted by technology. Understanding what technology is available to limit your labor expenditures can give you an advantage over your competition. The GIE+EXPO is always a great event to see what manufacturers are developing and what leading landscapers demand to remain competitive. 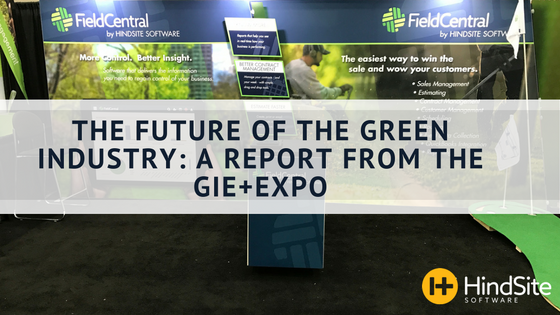 A walk through the exhibit hall can not only satiate your need to see heavy equipment but also give you great insight into the future of the green industry.